This project introduces the Analog Discovery's™ oscilloscope instrument. An oscilloscope is possibly the most useful, general-purpose tool of all electrical measurement systems. Oscilloscopes (commonly called “scopes” for short) measure voltage as a function of time. Most other devices used in the measurement of electrical signals (such as digital multimeters, or DMMs) make some assumptions as to the time-varying behavior of the signal being measured and provide a single number which supposedly characterizes the signal1. An oscilloscope allows the user to view the time-varying function directly, so no assumptions need to be made as to the actual signal shape. Oscilloscopes have a wide variety of features, which can be somewhat overwhelming at first. For this reason, we will introduce the Analog Discovery's oscilloscope over the course of several short projects. In this project, we will restrict ourselves to the basics of the way in which voltages are acquired and displayed by the oscilloscope. In this experiment, we will manually connect and disconnect power to an LED and measure the voltage across the LED using our scope. The oscilloscope instrument on the Analog Discovery uses the same connectors as the Voltmeter instrument. 1+ (the orange wire) is still the assumed positive terminal, and 1- (the orange wire with the white stripe) is still the assumed negative terminal. Since the oscilloscope and voltmeter instruments use the same terminals, these instruments cannot be used simultaneously. Using the voltmeter instrument disables the oscilloscope, and vice-versa. 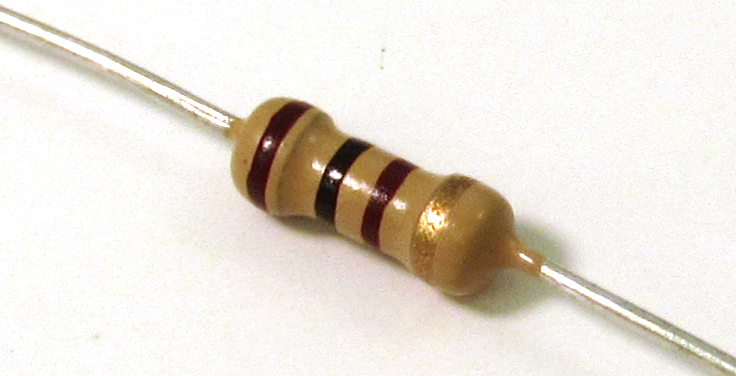 Be able to use the Analog Discovery Voltage Instrument to apply to a circuit. Be able to use the Analog Discovery Voltmeter to measure constant voltages. 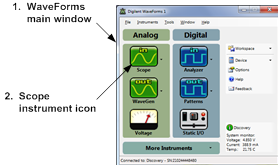 Be able to identify terminals on Analog Discovery used by the oscilloscope. 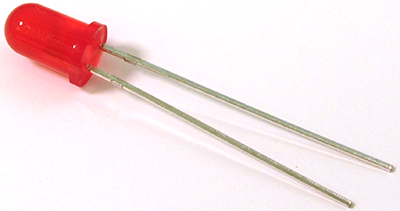 State the voltage polarity sign convention associated with the terminals. Be able to state how the reference voltage polarity and connection of oscilloscope terminals are related to the sign of the measured voltage. Use the Analog Discovery oscilloscope to measure and display time-varying voltages. 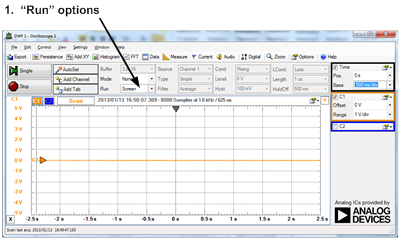 Be able to set vertical and horizontal scales on the scope main display window. Display the vertical scale for the desired channel next to the scope main display window. In this project, we will use the same circuit that was created in the Voltmeter Instrument project. Before proceeding through this exercise, set up the circuit according to Step 1 of the Voltmeter project. Your circuit should look similar to the image at the right. Open WaveForms™ to view the main window. Click on the Scope icon to open the oscilloscope instrument. An orange line should begin to traverse the oscilloscope waveform window. The line should be flat, at zero volts (according to the vertical scale on the left side of the window). It should traverse about one division every five seconds, per the time base we set in part B. Open the Voltage instrument and turn on power to V+, as described in the Voltage and Voltmeter Instrument projects. The LED should light up, and the voltage displayed on the oscilloscope waveform window should increase to about 2V. Unplug the V+ connection from your breadboard (simply pull it out of the board). The LED should go out and the scope should indicate that the diode voltage is zero volts again. When you are done acquiring data, click on the button. Change the Range and Offset in the Channel 1 control box. Note the effect of these parameters on the scale of the vertical axis on the scope's waveform window. 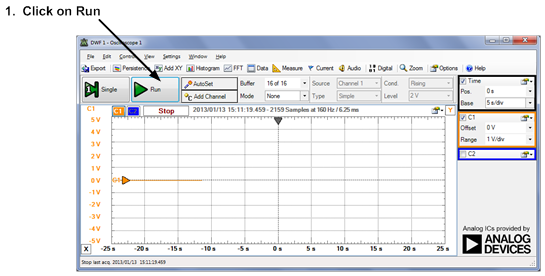 Connect and disconnect the V+ terminal and verify that the measured voltage still makes sense relative to your changes to the vertical scale of the waveform window. Change the Base in the Time control box. Note the effect of these parameters on the scale of the horizontal axis on the scope's waveform window. Connect and disconnect the V+ terminal, and verify that the measured voltage still makes sense relative to your changes to horizontal scale of the waveform window. Click on the button on the scope menu bar and select from the drop-down menu. The Run option, as shown below, will give you three options for viewing your waveforms: Screen, Shift, and Repeat. Set the time base to a relatively low value (about 500ms/div or so). Change the options between Screen, Shift, and Repeat. Connect and disconnect the V+ terminal several times for each option and verify that the display mode agrees with the descriptions below. In Screen mode, the wave form plot is generated by starting at the left-hand side of the display window. When the waveform reaches the right-hand side of the window, the waveform “wraps around” and reappears at the left-hand side of the window. It then resumes its left-to-right motion. In Shift mode, once the curve gets to the right-hand side of the display, the wave form will begin to slide to the left, so that new data points always appear at the right of the display. In Repeat mode, the wave form plot is displayed as a series of “snapshots”, similar to the frames of a movie. The frames are updated approximately once per the total duration of the data in the frame. Therefore, if the frame displays ten seconds of data, the refresh rate of the frames will be about once every ten seconds. 1For example, we will later introduce the concept of Root Mean Squared (RMS) values. These values are commonly used to characterize sinusoidal signals. Characterizing sinusoidal signals by their RMS value is perfectly fine as long as one is sure that the signal being characterized is actually a sinusoid. When a DMM displays an RMS value, the DMM generally makes the assumption that the wave being measured is a pure sinusoid—this can cause significant errors if the signal being measured is, for example, triangular. It is up to the engineer or technician interpreting the RMS value to know the shape of the signal being measured. This can be a problem since a DMM does not display the signal shape!